Problem: Available 2FA for all concerned editors. Everyone should have additional security on their account if they so desire. Why is it just limited to users with advanced permissions? Who would benefit: Currently these user group's still vulnerable (Template editor,Mass message sender,Ipblock-exempt,Edit filter managers,Pending changes reviewer,rollbacker,autoreviewer,patroller). And all the concerned editors who dont like to be hacked. Proposed solution: First, enable the "existing" 2 factor authentication for these user groups. Then make "Toolforge" enough capable so that it can provide "2fa" service for all editors. Hi Tisza Gergő . I've seen your contribution at phabricator. Highly appreciate it. Please give me some info. What's the current status of phab:T195207 ; phab:T180896 & Special:DisableOATHForUser ? What's it actually mean? Does it mean we implemented a "Special page" but it wont work until some specific criteria is fulfilled (triage)? Am i missing something? whats the most viable solution for these problems, you think? I understand , as a question of better security , "foundations" current focus is the "advanced user groups". Of course; the hijacking of a privileged account is much much more problematic than the hijacking of a couple or even many non-privileged ones. So here's some idea that i got (inspired from TheDJ) so that both parties could be happy & it won't cost WMF stuff's valuable time. In the "simple 2fa" make a option so that advance users can save their "Emergency tokens/scrath codes" in another location/device (it can be dropbox , lastpass or Keeper). As a additional security give them the ability to "make their own security question & answer's ". It could be stored in the same location. It'll only required when he'll make a "reset" request. Give them a web interface to request a reset . it could be a special page like "Special:ResetRequest" (SP:RR), similar to Special:DisableOATHForUser or it could be a "pop up" similar to those of fb/googles (as a part of mediawiki software). it could have a "dropdown menu" so that he can select his netive wiki & known admins. it could also have a "textbox area" where the user will write down something & try to prove his identity. Make that "interface/pop up" conditional , similar to those of fb/googles so that most of the hacker couldn't even make a request. User needs to enter his name and password to initiate request. Check if user knows his correct "security answer". Log if request was initiated from known device's,browser or ips. After all these criteria is fulfilled , the request will be automatically posted in two different place's . one will be the village pump (his netiv wiki) & the other will be the META (Steward_requests/Permissions#Removal_of_access). only after the the local community confirmed his identity , the local admin will ping a steward & he'll made the decision (by executing Special:DisableOATHForUser). 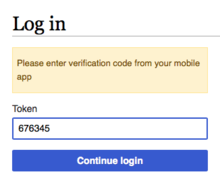 Like all the other popular web entity's (Fb/G) , we could make a SMS based authentication as a "Optional Beta Features". Though it's not the most secure way but we must agree that it make the user feel more safer then before. Like all the other popular web entity's (Fb/G) , we could make a "Saved Device & Login Notification" feature as a "Optional Beta Features". when someone try to login from a unknown device user will get a login notification & SMS. We could make a cryptographic feature similar to Fb's "Encrypted notification emails" . as a "Optional Beta Features" it'll make the reset & notification email more secure even when the email is compromised. mediawiki could have a function to generate "OpenPGP Public Key" like the way "igolder" do & it could be saved in another location/device (it can be dropbox , lastpass or Keeper).